Hatfield Town welcomed Risborough Rangers to Cotslandwick last Wednesday for a Division One Cup game between two sides who had been struggling to find any sort of form of late. The Blue Boys had lost 7-1 at London Lions with Rangers losing 7-0 at Hillingdon Borough in their previous league games so for the game to end goal-less was a positive in some ways for both teams. It was eventful game for Town player Darren O'Brien who missed a penalty in the 90 minutes but ended up scoring the winning spot-kick in a dramatic 8-7 shoot out victory for the home side which sparked scenes of celebration with all involved with the club as it was their first win in twelve games which was brilliant to see. Highlights of the game are below with the shoot out - I apologise for the quality of the footage from the shoot-out - my camera didn't like the lighting conditions where I moved to capture the drama. Risborough went on to lost 0-6 to fellow struggler's Codicote this Saturday which was The Cod Army's first league victory of the season. Manager Jamie Rayner had resigned just a few hours prior to this game and they are now on the look out for a new boss. Rangers next game comes on an away day to North London to play Park View FC on Saturday 27th October. 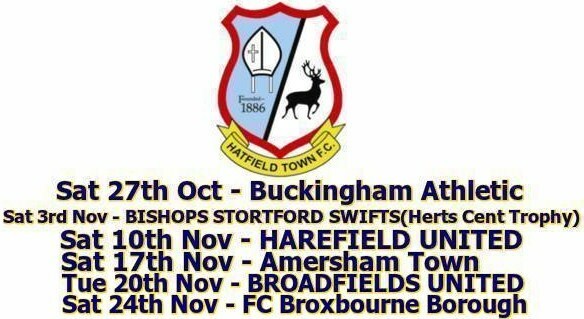 Hatfield Town's forthcoming fixtures are above. They travel to Buckingham Athletic this Saturday who are currently thirteenth in the table before a Hertfordshire Senior Centenary Trophy game against Essex Olympian League Premier Division side Bishops Stortford Swifts.